Blizzard-like conditions and snow coming down hard all day definitely impacted operations at many Tahoe ski resorts Monday. A severe snow storm and blizzard-like conditions shut down Squaw Valley Alpine Meadows on Monday (Feb. 4). The National Weather Service (NWS) in Reno issued a blizzard warning Monday afternoon that was in effect until at least 10 p.m. Monday (Feb. 4). Winds could be as strong as 50 mph, with gusts over Sierra ridges expected to exceed 100 mph. Heavy snow was in the forecast through the day and into Monday evening. A winter storm warning is set to remain in effect until 4 p.m. Tuesday. The storm, which has delivered over 4 feet of snow to some area Tahoe ski resorts, could bring an additional 2-4 feet of snow at lake level and 3-6 feet of snow above 7,000 feet, according to the NWS. Snow drifts could be deeper than 10 feet. The storm is expected to move out of the area Tuesday night. Several days of sunny conditions are expected before a chance of snow returns Friday, according to the weather service. Due to the severe conditions, Squaw Valley Alpine Meadows, Kirkwood and several other Tahoe ski resorts were closed Monday (Feb. 4). Sugar Bowl was open until mid-afternoon when the conditions warranted shutting down for the day. Sierra-at-Tahoe had limited operations and was experiencing blizzard-like conditions. Northstar California was open all day, but shut down its upper lifts at 3 p.m. Among Tahoe ski resorts, the place to be Monday was probably Homewood Mountain. Located on Tahoe’s West Shore, the resort is very wind protected. Homewood has received 56 inches from the storm, including 26 over a 24-hour period ending Monday morning. See the latest Snow Report below. Sugar Bowl has received the most snow of any Tahoe ski resort during the storm, getting 57 inches – nearly 5 feet. 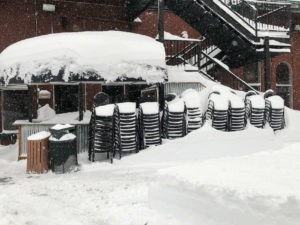 Five Tahoe ski resorts are reporting 50 or more inches from the storm. Kirkwood Mountain received 54 inches, including 20 over the past day. Sierra-at-Tahoe reported 2 feet of new snow Monday morning and a storm total of 54 inches. “It’s coming down out there,” Sierra spokesperson Sarah Sherman said Monday afternoon. Squaw Valley Alpine Meadows received 2 feet of snow in the last 24 hours, bringing its current storm total to more than 3½ feet and counting. This storm has also pushed Squaw Valley Alpine Meadows past 300-inch mark for total snowfall this season. 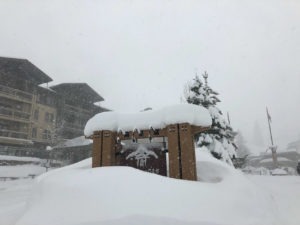 “The snow has refused to let up, and the resort is experiencing whiteout conditions due to heavy snowfall and high winds, and avalanche danger continues to be high today,” said Squaw-Alpine spokesperson Alex Spychalsky. Sierra-at-Tahoe reported 2 feet of new snow Monday morning and a storm total of 54 inches. OpenSnow California Snow Forecaster, Bryan Allegretto says a second storm system could bring 1-2 feet during the day on Monday. Ridgetop gusts to 60+ mph. He says a final storm moving down the coast will continue the snow Monday night, with lighter snow showers through the day on Tuesday. Another 6-12 inches possible Monday night, and a final 3-5 inches possible for Tuesday.